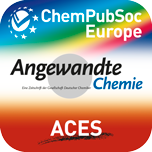 This multi-journal App combines the content published in the ACES journals, sister journals Angewandte Chemie, Chemistry – A European Journal and EurJOC, and all the rest of the ChemPubSoc Europe journals. If you already access the journals content on Wiley Online Library, you can get access to full-text content on your mobile device at no extra cost. Otherwise, a subscription is required to access content.